Ships Today if ordered within 8 hrs and 45 min. Use:	Safe for use on all whiteboard surfaces. Safe for use on all whiteboard surfaces. Its Ergonomic shape makes eraser comfortable to hold and easy to use. Eraser is made of light-weight and durable material, with a long-lasting felt cleaning surface. 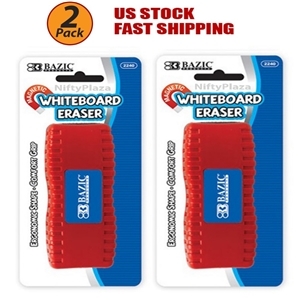 Magnetic whiteboard eraser conveniently adheres to any metal backed whiteboard or steel surface.